The days-long manhunt for Miami-Dade fugitive Alberto Morales ended in the Texas woods early Saturday, when he was shot and killed by police, authorities said. A Friday night burglary at an unoccupied home, in which men’s clothing and jewelry were stolen, prompted police to search nearby woods and find the 42-year-old fugitive there, according to Sgt. Robert Eberling, spokesman for the Grapevine, Texas, Police Department. Holding wooden sticks in his hands, Morales ignored commands and lunged toward officers, Eberling said. 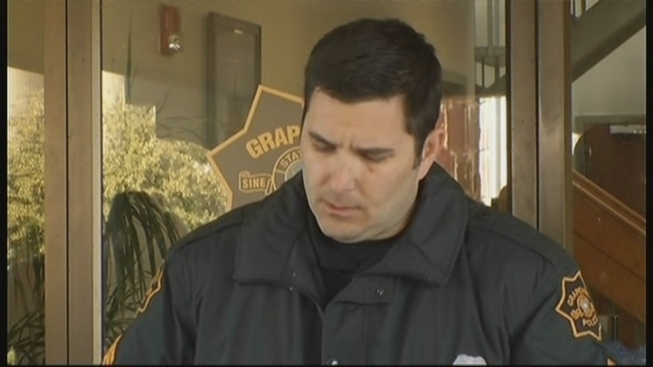 Fearing for their safety, the officers -- a Grapevine officer and two members of the U.S. Marshals Fugitive Task Force -- used deadly force, Eberling said. “We successfully stopped a violent fugitive and ended the fears that he brought to so many people,” Eberling said Saturday afternoon at a press conference. Police search for Alberto Morales, who is accused of stabbing Miami-Dade Police Officer Jaime Pardinas in Texas. Miami-Dade Police Director J.D. Patterson discusses the case. Monday night, Morales used a piece from his eyeglasses to stab Miami-Dade police Detective Jaime Pardinas and escape in Texas, police said. Pardinas and Officer David Carrero at the time had been taking Morales to Las Vegas for a court appearance. "To our Detective Jaime Pardinas, I commend you for your will to live through this horrible event that you've endured, and we look forward to your safe return home," Miami-Dade Police Director J.D. Patterson said in a statement Saturday. Patterson added: "To the victims who suffered at the hands of this diabolical individual, may you now have peace knowing that he will not be able to hurt you or anyone else again." Saturday afternoon, Miami-Dade police announced Pardinas has been released from the hospital and continues to recover. On the loose, Morales had been a threat to the public, given his criminal history of sexual battery, kidnapping and other offenses, authorities said. Morales, apparently unfamiliar with the Texas region, may have turned to the woods to hide, Eberling said. Officers in recent days had searched boathouses and other locations, but didn’t find him. Although police suspect that Morales didn’t receive help from anyone while free, he still somehow slipped out of the handcuffs and belly band to which he was shackled, Eberling said. Saturday, Morales still had on his hooded prison sweatshirt. He also wore long pants that he didn’t have before. Eberling said he didn’t know whether those pants were from the home burglarized Friday. Multiple agencies intend to keep investigating the events that led to the escape, which Morales had likely planned for “a long time,” Eberling said. Days ago, Pardinas and Carrero had planned to travel by plane to take Morales to Las Vegas, but they were forced to rent an SUV after Morales acted up on the first flight to Houston, police said. They were told they wouldn't be allowed to make the connecting flight, police said. When they stopped at a Texas Walmart to use the restroom, Morales used a broken piece of his eyeglasses to stab Pardinas in the chest while Carrero was inside the store, police said. Morales then vanished. About 10:30 p.m. Friday, officers responded to the burglarized home a few miles from the Walmart, Eberling said. The items that were stolen drew investigators’ attention. As the officers approached a wooded area, they could hear somebody moving. Officers asked for help from Fort Worth police, who sent a helicopter equipped with an infrared camera that helped find Morales in the dark woods, Eberling said. Officers saw that Morales was running from them. Eberling said he didn’t know whether Morales was holding the wooden sticks to use them as weapons. But officers knew Morales was skilled at using objects as weapons and probably didn’t forget that during the confrontation, Eberling said.